Product #18720 | SKU LP36793 | 0.0 (no ratings yet) Thanks for your rating! Keeps your action cameras & gear safe from impacts, debris & moisture. Keep your action cameras and gear safe from impacts, debris, and moisture with this IP67-rated Hardside 200 Video Hard Case from Lowepro . 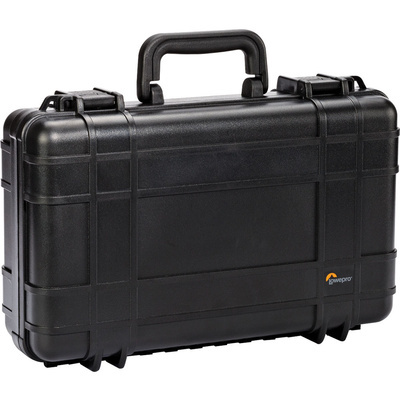 Constructed from high-impact ABS polymer, this waterproof and airtight case includes a soft-sided protective insert with adjustable dividers designed to accommodate five to ten action cameras along with multiple mounts, attachments, and accessories. The insert is removable and features tuck-away straps, allowing it to be used as a backpack when hard shell protection isn't required. Integrated release valves on the hard case latches provide automatic pressure equalization when there are changes in atmospheric pressure.